A report released this week by the Eurobarometer marks one year since the entry into force of the EU Portability Regulation which allows Europeans to use their online subscription to services such as Netflix or Spotify in other Member States. The study found that 49% of people who have travelled in the EU have used the possibility to access their online subscriptions while being abroad. The regulation, which entered into force one year ago, obliges service providers to give access to their subscribers, without additional charges, to the same content on the same range and number of devices and within the same range of functionalities as those offered to the user in the Member State of residence. All providers who offer paid online content services must follow the new rules, whilst the services provided for free (such as the online services of certain TV or radio broadcasters) have the possibility to also provide portability to their users. European Commission Vice-President for the Digital Single Market Andrus Ansip welcomed the results stating that “the Digital Single Market is breaking down digital barriers for the benefit of consumers and business. We are very pleased to see that Europeans actively use their new digital rights”. The European Commission has launched a call for tenders with the objective of monitoring the progress in the deployment of broadband networks and to measure primarily the household coverage of different fixed and wireless broadband technologies with a special focus on next generation access technologies and very high capacity broadband. The online procedure has marked the deadline for receipt of tenders as 7th May 2019. INATBA, the International Association of Trusted Blockchain Application, was launched this week with the objective of lobbying for blockchain technology. More than 100 companies and organisations including L’Óreal, Engie, IBM and Deutsche Telekom are among the founding members of INATBA, and another 70 organisations are on the waiting list. INATBA relies on strong support from the European Commission. In fact, Commissioner Mariya Gabriel, responsible for the digital portfolio, stated: “I believe that we all agree on our mission: help creating the global framework for bringing blockchain to the next level”. Roberto Viola, Director-General of the European Commission’s DG Connect, published a blog post in which he stated to be glad “to see that INATBA was born in Europe with global ambition. This moment will be remembered many years from now as a turning point in the development and implementation of blockchain technologies”. The countries from the Western Balkans agreed earlier this week to lower and ultimately abolish roaming charges by 2021. More concretely and from July onwards, roaming charges will be reduced by 27% in Albania, Bosnia, Kosovo, Serbia, Montenegro and North Macedonia. The agreement, which was supported by the EU, was signed at a digital summit in Belgrade. Serbian Prime Minister Ana Brnabić stated that the agreement had been signed in a “not easy moment, when Pristina violates regional agreements” [referring to Kosovo’s imposing a 100% tariff on Serbian and Bosnian goods], but she said the country “was sending a signal to give a chance to the region to be prosperous and to have different future”. Commissioner for European Neighbourhood and Enlargement Negotiations Johannes Hahn tweeted: “Great news: as of July, the Western Balkans citizens and companies will pay significantly less roaming fees for surfing, texting and calling across the region”. A new study published by the cybersecurity firm F-Secure shows that weak passwords and security measures have contributed to attacks on connected devices increasing for at least double from 2017 to 2018. As Internet of Things (IoT) devices are deeply interconnected, the report argues that other devices are at risk of being infected. More concretely, hackers could find the weakest link between connected devices and use the weakness as a backdoor to other devices. Vera Jourová, EU Commissioner in charge of Justice, Consumers and Gender equality declared to EU news-oulet EurActiv that “regulation will not solve Facebook’s problems stemming from lax data protection, like the Cambridge Analytica scandal or other more recent breaches”. More concretely, the Commissioner suggested that Facebook should “look at itself” and “start looking at their users as citizens and take responsibility for the problems they help create”. Jourová’s statement takes place after Mark Zuckerberg’s opinion article in The Washington Post in which he called for a “more active role for governments and regulators” to regulate the Internet in order to “preserve what’s best about it”, thus aiming at a balance between freedom of speech and protection from broader harms. Zuckerberg’s call was received with worry in Brussels, and some Members of the European Parliament thought Facebook was trying to “divert scrutiny from other areas” in which the company had been put under the spotlight. After losing the internal primaries in her party bared her from running as a candidate for the next European elections, Dutch Member of the European Parliament Marietje Schaake is deciding what to do with her strong legacy on digital issues. She spoke to EU news website Politico about her views on the EU’s regulation of several aspects of technology. In her view “there’s an implicit sense that we should have our own model to govern technology”. More concretely and in contrast to the US market-driven model or the Chinese state-centred one, she proposed a European human-centric model that enhances trust. In this regard, MEP Schaake argues a lot of work is still needed in the area of cybersecurity. Schaake considered that the EU needed to do more in order to show what security can look like, while respecting privacy and human rights online. The latest compromise amendments on the legislative proposal on terrorist content online will be voted in the European Parliament’s Civil Liberties Committee (LIBE) next Monday. Reactions from groups such as Wikipedia, Mozilla and the inventor of the World Wide Web Tim Berners Lee surfaced not long after the amendments were leaked to the news. 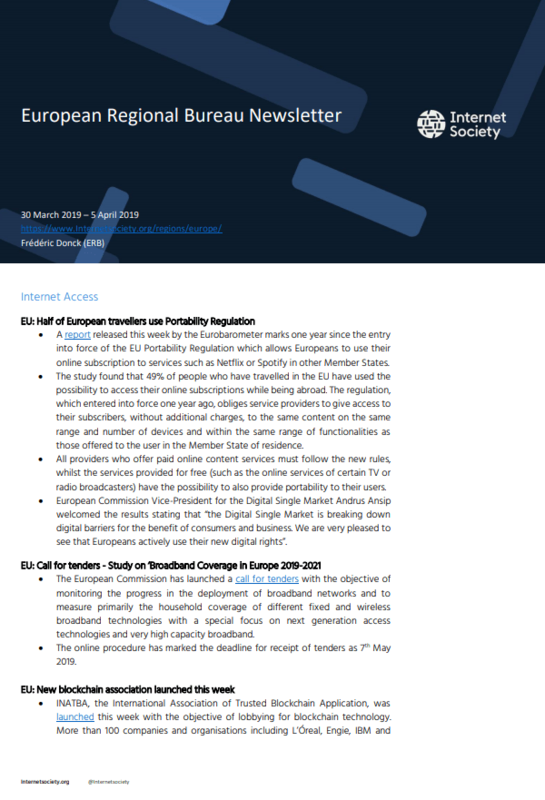 Internet stakeholders published a joint letter raising concerns about the legislation. In their view: “The EU Terrorist Content regulation, if adopted as proposed, will restrict the basic rights of European Internet users and undercut innovation on the Internet without meaningfully contributing to the fight against terrorism”. Daniel Dalton, Member of the European Parliament leading the procedure, shared the concerns expressed in the letter and stated he was working towards building a consensus within the work of LIBE. 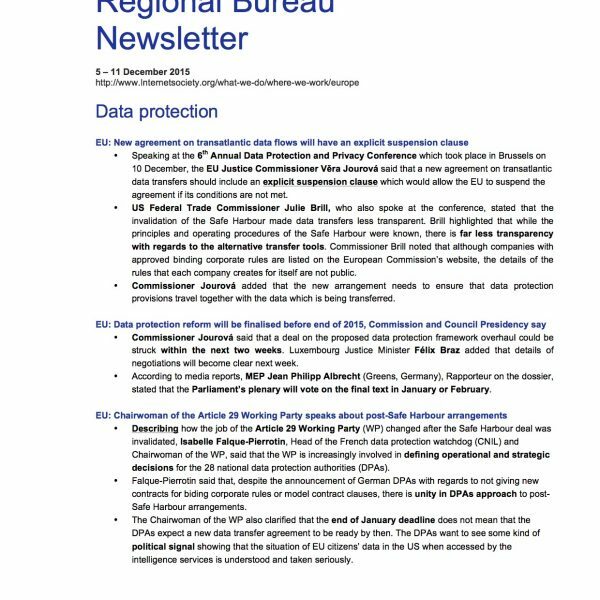 The UK has amended the EU data protection law (GDPR) and data flow between the EU and the UK preparing for a potential no deal scenario. 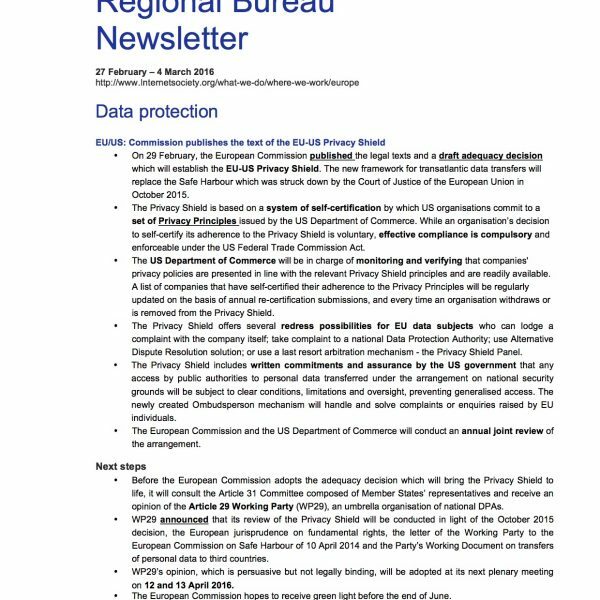 More concretely, GDPR will remain applicable in the UK, but the free flow of personal data might be affected. The UK proposed its “European Union Withdrawal Act 2018” to ensure that UK law works effectively and retains a strong compatibility with EU regulations once the country leaves the EU. The objective of the withdrawal act is to directly incorporate into UK national law rules coming from the EU immediately before the date of exit from the EU, thus creating a new category of law: EU retained law. Rules will then be automatically incorporated into the UK’s legislative framework, but will remove references to EU institutions that are no longer valid. Twitter has taken the decision to suspend a French campaign #OuiJeVote, aimed at stimulating electoral participation during the EU elections, on the basis of France’s new law protecting information manipulation that had entered into force December last year. The law requires hosts of online political campaigns to clearly state who bought the adverts and how much they costed. Twitter took a cautious approach and banned the ads. The French response came immediately, including from the government’s own information service, which stated: “Twitter does not know how to do that [to provide fair, clear and transparent information on who bought adverts], and so decided to have a completely hard-line policy which is to cut any so-called political campaigns”. According to the national authority, this was ‘public information messages’ and not ‘a political campaign’. On Thursday morning, the French government released a statement in which it made clear that the objective of the law was not to “ban platforms from publishing [political] content” but rather to “allow users to be informed about whether the content published had been subject to remuneration”; which acquires particular relevance in electoral times. Few hours later, Twitter took back its decision publishing a declaration underlining its commitment with the protection of the integrity of the EU elections and clarifying that after several exchanges with the French authorities, they had decided to allow the campaign in question.